Send me your email and I will keep you posted on events, gallery shows and other cool stuff. I like images of obscure places or highlighting unnoticed things we pass every day. I asked a room of 20+ locals if they recognized this place and all said no. It’s the funky MiddleEastern-inspired architecture at the Riverside county fairgrounds celebrating date farming that still thrives today. Acrylic on canvas 48x36 in. Seriously, Havana made my head explode. The colors, the textures, the music and of course the warm, friendly people make Cuba my new favorite destination. I couldn't possibly design a movie set better than the streets of Old Havana. And for adventurous travelers, the Centro neighborhood offers a more gritty version of the city. Free of tourists, I got a genuine sense of Cuban life, punctuated with odd moments like a whole chicken (minus its head) thrown into the street and watching a restaurant patron toss unwanted tomatoes from his sandwich out a window and unto the sidewalk. Without a doubt Cuba has already seeped into my work. Sensory overload of visual elements and sound are central themes of work I've created since my return. I want to combine textures, colors and shapes in ways that seem unlikely and surprise the viewer with its spontaneity. More to come. In the meantime check out what I've doing lately. Habana Vieja, mixed media on wood panel, 24 x 18 in. 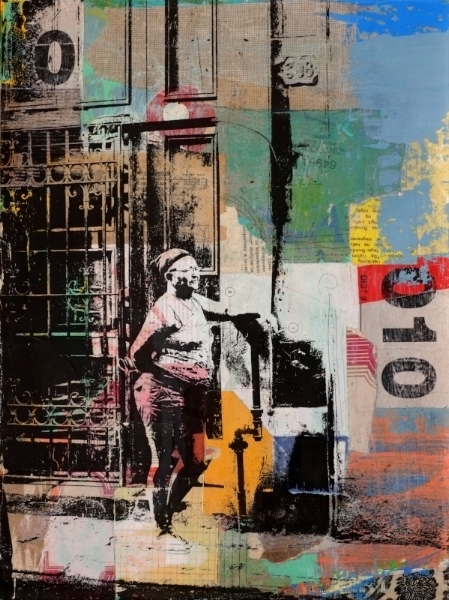 fine art with a distinctive urban style.